The Cake Engineer: We've been featured! A few of my cakes have been featured on Cake Mom! 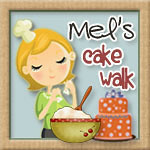 If you haven't checked out Cake Mom, she has a lovely blog with tons of great giveaways! You're so famous! Congratulations on the publicity...so well deserved!